The Paddle Round the Pier swims return for 2019 with some exciting new additions. Choose from three distances of iconic open water swims off Brighton beach, or enter the Triple Crown and do all three! The Paddle Swim Classics return in 2019 with some exciting new additions. For the first time ever, we’re offering a full "Iron" distance 3.8km swim in addition to the 1.5km and 2.5km swims, as well as a Triple Crown option to swim all three distances. All swims will be organised by Brighton Tri Club’s friendly volunteers, so whichever distance you choose, you can expect our usual high standard of event. As in previous years, entry fees for these events help to support Paddle Round the Pier with a fixed amount of each entry going straight to the charity. The remainder goes to cover overheads and helps to fund Brighton Tri Club. The whole event is organised and staffed by volunteers, and all monies raised stay local. Entries are limited. Last year was a sell out, so get in early to guarantee your place on a swim around some of the most recognisable landmarks on the British coastline. 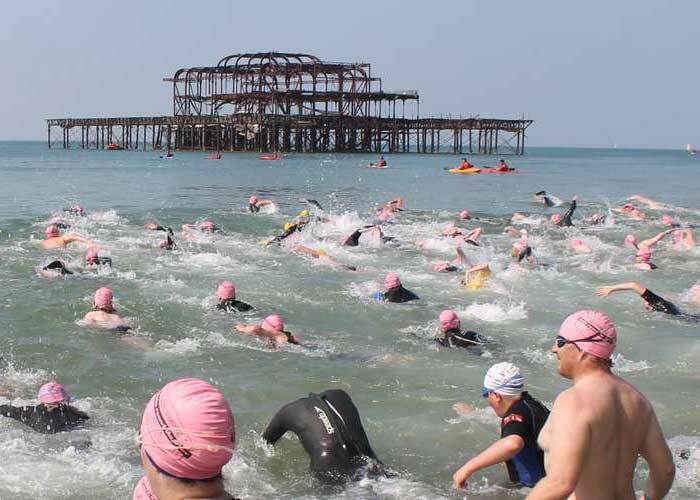 Sponsored by SwimTrek, this fun sea swim will see you cover 1.5km and offers the chance to navigate around the iconic, Grade I listed West Pier with the stunning regency seafront of Brighton to look back on. Sponsored by Sea Lanes, this 3.8km swim runs West to East starting at Hove Lawns and finishing between Brighton Palace Pier and Black Rock. Not sure which distance to choose? It will be possible to switch down from the 2.5km to the 1.5km for a small admin fee nearer the date, so if you're undecided, be brave and go long. After your swim, why don’t you plan to stay on and enjoy the unique atmosphere at Paddle Round the Pier weekend festival – repeatedly voted one of the best days out in the UK and voted “Best Festival” at the 2014 Brighton and Hove Business Awards in spite of exceptionally stiff competition. Paddle Round the Pier features the very best in water, street and urban sports, live music, kids entertainment, ‘have a go’ opportunities, world food courts and much more! There is also a whole Paddle Village of exhibitions, water sports and beach lifestyle brands for you to explore après swim.